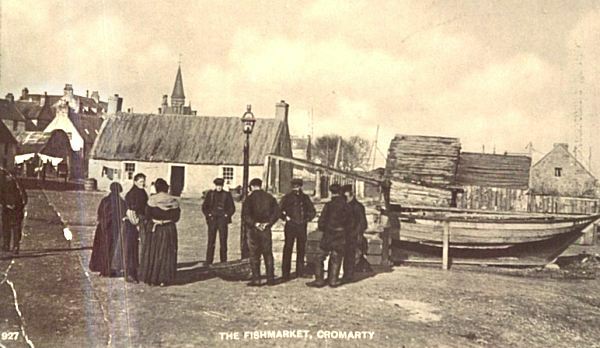 Cromarty Fish Market in Shore Street at about 1900. This picture clearly shows a street lamp where as in a similar picture of about the same date (see picture #804) it is absent. As there was no gas works the lamp could only have been oil or electrically powered. If electric either my date is way out or the town was at the cutting edge of technology. Can anybody enlighten me? I seem to recall from research that David Alston undertook about 15 years ago that Electricity came to Cromarty in the 1920's using ex-navy generators that were re-used from the forts. I have in my garden the top half of a cast iron light stand that looks very similar to the one in the picture above. I recovered it from the beach a few yards north west of the burn outlet at the junction of Shore Street and Burnside. This was in the winter of of 1986, where extensive scouring of the beach and stones (caused by changing wave paterns due to the rock amouring deposited in 1984/85) exposed a lot of metal debris. Apart from the lamp stand, and along with a lot of metal bars, iron rods and old bed irons etc, I found a WW1 Royal Garrison Artillery Hat Badge, and live .303 rifle round! Thanks Calum, it would appear that I may need to change the date then. Any idea when the extension was added to the cross house in the background? Andrew - the lamp may well have been oil "powered", and predate the introduction of electricity to the town. I suspect that your date is maybe only out by 10 years. Someone will know the exact date of the extension, but the windows look post WW11 to me.